Do you want to get rid of your used items or goods that you do not use? After all such things are only occupying unnecessary space in your home. However, there is no need to worry as you can get rid of such goods via a garage sale event. You have to fix one date and time for the event and inform about to your neighbors. The best way is, however, to create eye-catching garage sale flyers and distribute it to as many people as you can within your locality. 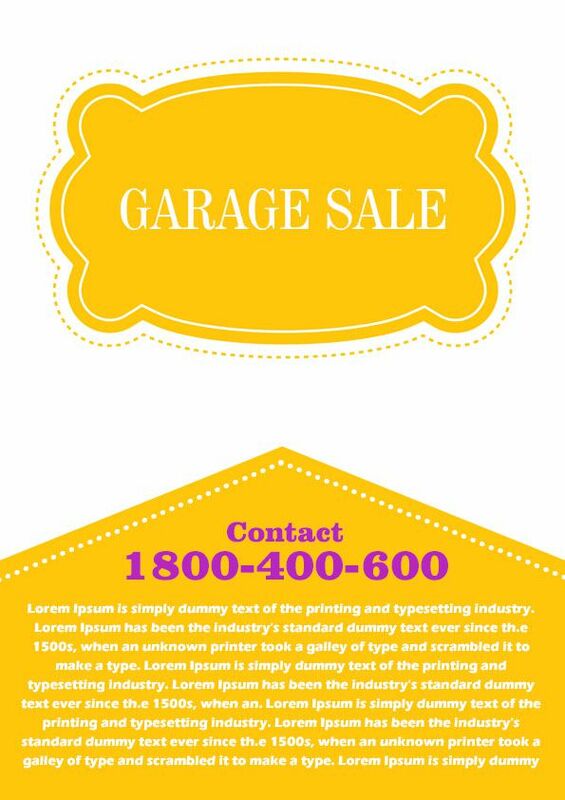 Since creating such a flyer is tricky, we are presenting a collection of attractive garage sale flyers that you can use for your sale. 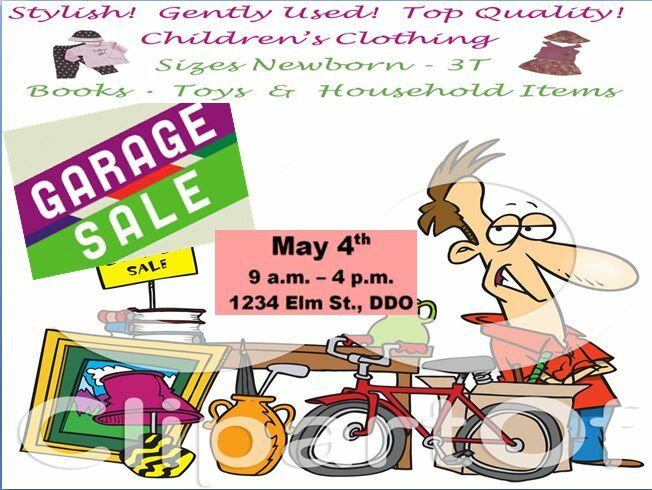 Check out multiple garage sale flyer ideas from the below templates. 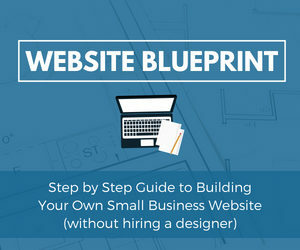 The flyer template features a big header in blue and red inside a box. Below the same is a green space with text in white. The template also features a couple of multicolored boxes of the same size with text and a large pink text box at the center. 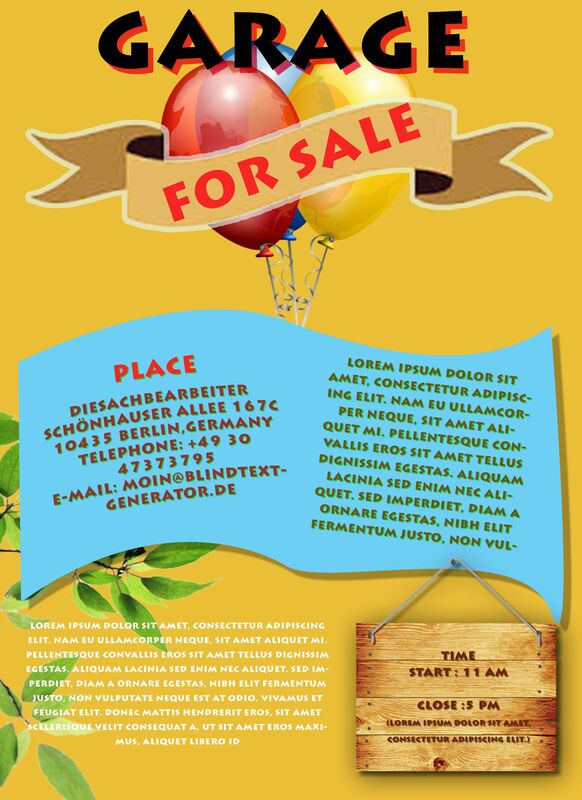 With a mustard background, the template features a prominent header in black and a bunch of colorful balloons at the top. It also features a blue wavy box with text below which a board is hanging at the right-bottom. 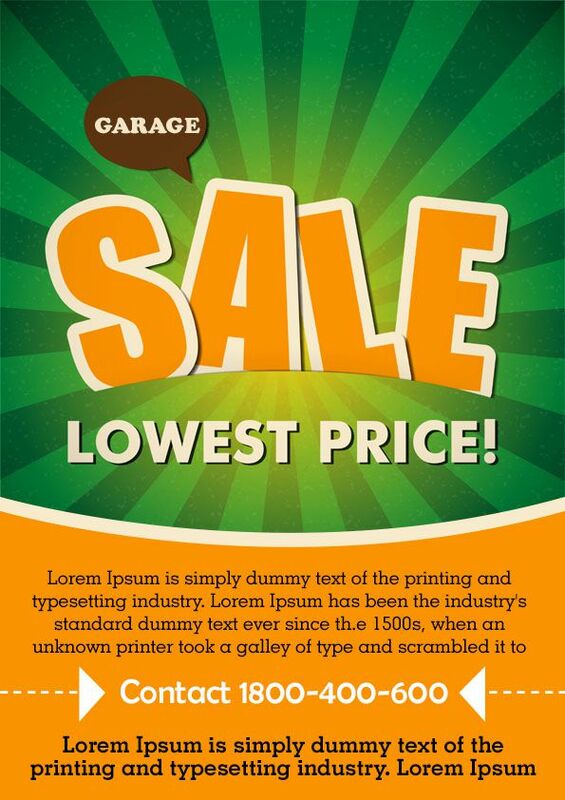 There is also text in white to convey complete information about the sale. With an abundance of text on various text boxes of different colors, the flyer looks great with blue colored boxes at the top-left and bottom. There are also splashes of red and gray on a white background. The template features decorative box in yellow at the top and a pentagon shaped text box at the bottom on a white background. It has white and purple colored text on a yellow background that makes it all the more attractive. With a border resembling red bricks, the template is an apt one for a garage sale. The template features a header on a yellow background, text in yellow at the center, and contact details at the bottom in black font color. The template is a beautiful one with the word ‘Sale’ in a big font size at the top in orange with a white border. Behind the same is a background comprising of black and green colors with a call out box at the left. The lower half of the template is in orange wit text in white and brown. 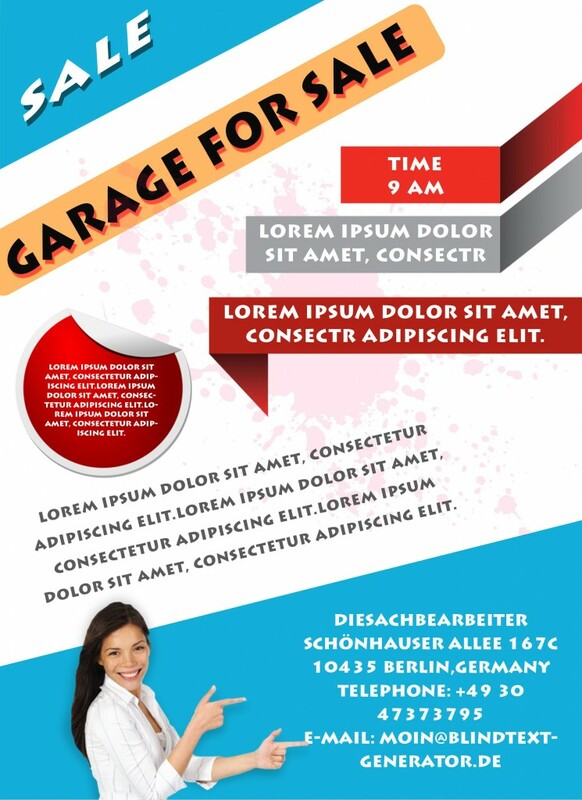 It is a good idea to list all the items of sale on your flyer and the template exactly does the same with multiple text boxes of bright colors having desired text at the bottom. 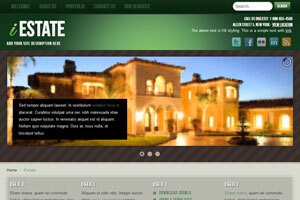 Rest of the template features a simple design with a white background, colorful header, and text. The flyer has a combination of pink and blue to grab all eyeballs. However, it is simple in its design with a large header box and a text box below the same on a white background. The text is in four different colors i.e. blue, pink, black and brown that makes it more appealing. 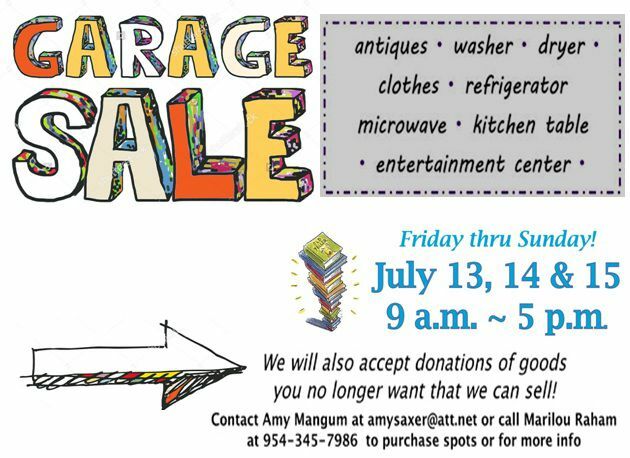 With a signage board of garage sale at the top left in a blue box, the template features text in pink and black on a pristine white background. In spite of much text to give all details about the sale event, it looks clean and beautiful. 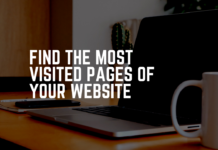 The template is an eye-catching one with multiple images of used items for sale like slippers, books, clothes, shoes and much more at the both sides of the header. However, at the bottom too, there is an illustration of a house and a text box featuring all the items on sale in bullet points. 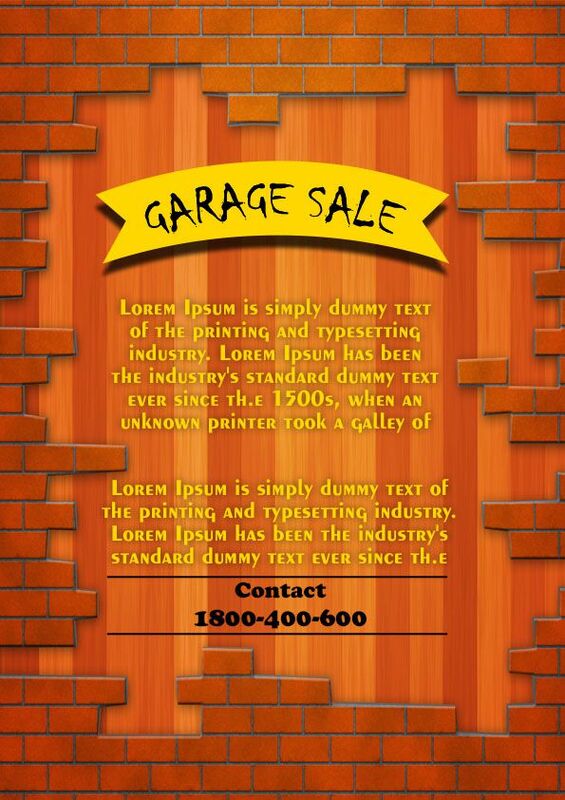 The template has all the ingredients to make it a catchy flyer for a garage sale event. While the items for sale are in a nice font in gray and pink at the top, there is a nice illustration made of vivid colors below the text on a white background. 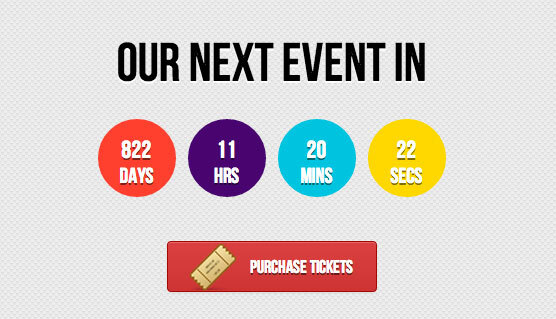 The design of the template is simple with all its text to the right including date and venue details. To the left lies the big header in attractive colors and a hand-drawn arrow pointing to the right. 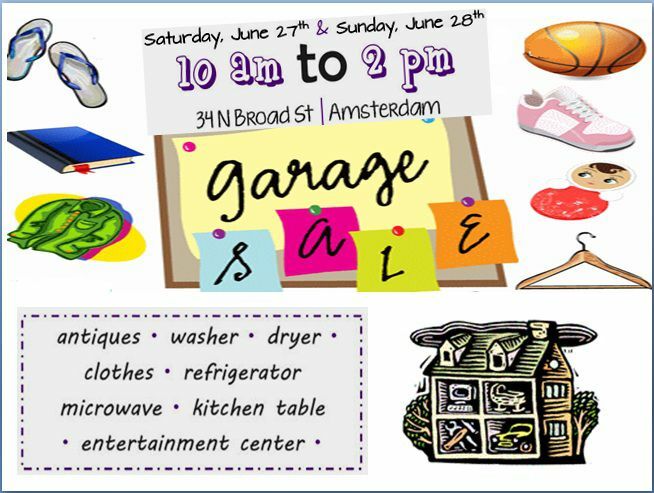 Garage sales are small sales of household appliances, furniture or other things that are held in one’s front yard to sell off excess, used or old items. Anyone can hold one when they need to sell some items and need some cash. But there are a few aspects to a successful garage sale. One of these main aspects is an advertisement or publicity. 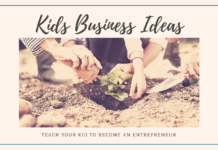 This is easily achieved using flyers and posters, but these mediums must be used in such a way that they bring in a large number of potential buyers. This can, in turn, help you to boost your sales. So here are the things you need to know in order to create a good ad flyer/poster for your yard sale. Before you go and make a full ad for your sale, you should take a look at the ads for such sales that come in your local newspaper and in garage sale websites. This will help you to understand what will work and what won’t. If your ad comes in the local printed press then it conveys certain factor of attraction. When people see such ads they expect that the garage sale would be worthy enough for a look. So the amount that you would spend on putting the ad in the press would make up for it in spades. As you may have seen, the first part of an ad one notices is its heading. Due to this, it is the most important part of the ad. So the heading has to be thought-provoking. It is absolutely useless if your ad has great content like descriptions and photos but no heading. You should also use the same theme and wording you used in your flyers provided that it is eye-catching. This will help to further tie the ad to your sale and tailor it for you. The ad is meant to sell your items, it should do that. The items should be described and shown off; it should not be a plain list. If you’re selling clothes then their sizes, brand names, and colours should also be included. The ad should give a reason as to why people should come to your garage sale. The ad must not contain any type of false information. You must be completely honest about the products, their conditions, and flaws. You should also mention things like missing part or parts that don’t work. You must take care to include photos of interesting items if you can. This will help to attract buyers to your sale. If the site of your sale (which is most probably your home) is not in a well-known area or locality then include pictures or prominent landmarks and directions to help the buyers find your home. If possible include a map, but do not pinpoint your home just show the street, as that way early birds won’t find it too easy to find your home. The time of your sale must be clearly indicated in your ad. For example: – if your sale has a late lunch time start then highlight that. This helps to prevent the buyers from thinking that they’ll just get leftovers if they come late. You should not use the phrase “Everything must go”. This is a common miss conception. This is a waste of space as everyone knows that you need to sell everything. Also, it makes you sound desperate to get rid of all the items. Take special care to not use words like “miscellaneous”, “general household” or “bric-a-brac” as it is too common and seen in all garage sales. Shoppers are interested in the specific items that you have for sale and are looking for reasons as to why they should attend. A closing time gives a certain amount of power to your buyers. This is due to the fact that they can drop in after you’ve packed up and ask to see what is left as they know that they will be able to get it at very low prices. If you take away the close time then buyers have less bargaining power as they don’t know your desperation to sell off what’s left because for all they know you’re sale could go on for another day. Even if you do this, customers may ask when you are going to close. “When it’s all sold” should be your answer to this. So you give the impression that you won’t be giving anything away later. If you do give a close time in your garage sale flyer, then you can be prepared for the last minute rush. By that time the customers will return looking for bargain-basement prices. This way they won’t be coming in all afternoon and evening. You will also have an added advantage when the last minute rush starts. It will bring a renewed competition between customers and will give you some bargaining power as they are trying to snap up bargains before anyone else. If the garage sale is short a sense of urgency is introduced as the customers know that they need to buy now or it may be gone soon. This is a sales tactic called “limited time offer” which is very commonly used in all forms of retail and it works in garage sales too. Buy a kitchen sink and put a price tag on it so that you can use the sentence “Everything must go including the kitchen sink”. This is very eye catchy and you can get your money back by pricing the sink appropriately. 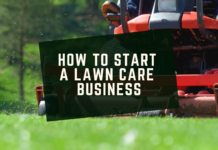 If it doesn’t sell then you can use it in your next sale. The early birds always swoop in looking to grab better deals before others. They may even come in an hour before your opening time. Your sale should be easy to fund, but not that easy. Help the buyers find your street. You can do this by providing simple direction or popular landmarks. Take care not to include your house number as then early birds will surely flock in. Your advertisements should go out early and they should be everywhere. They should go up at least a week before the sale (mostly on sites like Craigslist and Backpage). You can also send out a reminder for your sale the day before. Social networks can be used for advertisement. 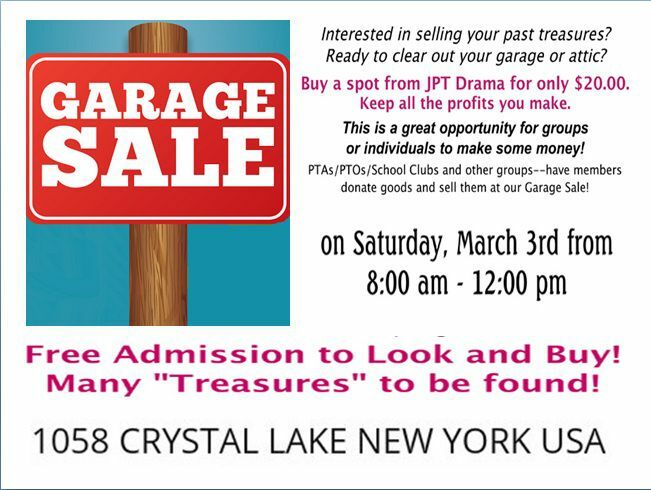 You can do this by posting your garage sale on your profiles in Facebook, Yahoo groups, LinkedIn etc. A classifieds column ad in your local newspaper is also a good way to go. You can place one, a week or few days before the sale and one on the sale day provided that the costs are low. You can also make your ad stand out by using special symbols or graphics but this may cost a bit more. If the sale is big or involves numerous families then you can place an ad in the newspaper’s events section. You should remember to place the ad a few days before hand as buyers are known to check on Craigslist for planning their routes. You can also repost your ad on Craigslist so that last minute shoppers will see it. 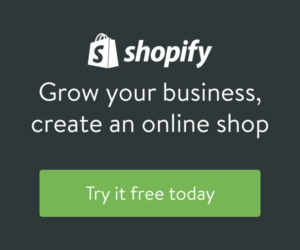 Advertise multi-day sales as separate sales. If you are planning on holding 2-3 day sales, then treat each day as a separate sale. After this, place ads for each sale individually. If you advertise it as a 2-3 day sale shoppers will assume that all the good stuff will be gone by the second or third day and hence won’t bother to go. They are more likely to come in the second if they think it is a one day sale. You should consider putting out a non-English ad if you are in a multi-cultural neighborhood. You should not upload photos directly on to craigslist as this may cause loss of clarity. You can upload your photos to a photo hosting site and then provide the links in your ad on craigslist. The code can help shoppers find your ad online faster and get more details of the sale. Advertising is very crucial as the chance of getting a good amount of passing traffic is unreliable. Ads should be placed 1-2 weeks in advance as this would give the shoppers enough time to plan a trip to your sale. Customers need to come from the city too, so advertise in the city paper. You can bring in more shoppers by selling the idea of friendly people, country cooking, fresh air and a good picnic spot with great scenery. You can also plan your sale in such a way that it coincides with a large event in your town. You can also place your signs in places with high passing traffic. You should also include detailed instructions to help people find your sale. If the whole town is involved then it will bring in a large number of shoppers. The authorities may check your ads with the list of permits issued in order to identify a sale without a permit; they do this before posting a fine. So if you forget to cancel the ad, you may get in trouble if they demand a fine for a sale that you didn’t have. All the interesting things you have should be listed. You should also include the important details like size, history, condition, etc. The words included must sell the items you have. Try and include large, clear and detailed photos of your items. You can refer photo tips on ebay.com for tips on taking the perfect picture. You should only include the street address and not the house number. They should wait for the street signs to go up in order to find out where the sale is. Otherwise, you’ll be getting shoppers all through the week asking to see the items. Give people a reason to come to your sale. Do not use the phrase “Everything must go”. It will make you sound desperate to get rid of your items. LOTS AND LOTS AND LOTS OF STUFF!! 10% of sales to be donated to local charity. But should make sure to do this. Annual Garage sale. This suggests that you have one every year (you can still use this even if it is your first sale, but try to avoid saying a specific number like “fifth annual Sale”). It also makes people think that your stuff is only a year old. In cases of group sales, try and use words like HUGE MULTI-FAMILY GARAGE SALE!! Or FIVE FAMILY GARAGE SALE. If you include words like ANTIQUES or COLLECTIBLES, it will attract serious collectors and will discourage casual buyers who may fear higher prices. Use MOVING SALE or GOING OVERSEAS only in those scenarios. Moving sales have better items than normal sales. But as tricking people is not appreciated try to avoid false advertisement. Do not use words like ESTATE SALE unless someone has died. If falsely used it would result in angry customers, as there is a big difference in how an estate and a garage sale is hosted. 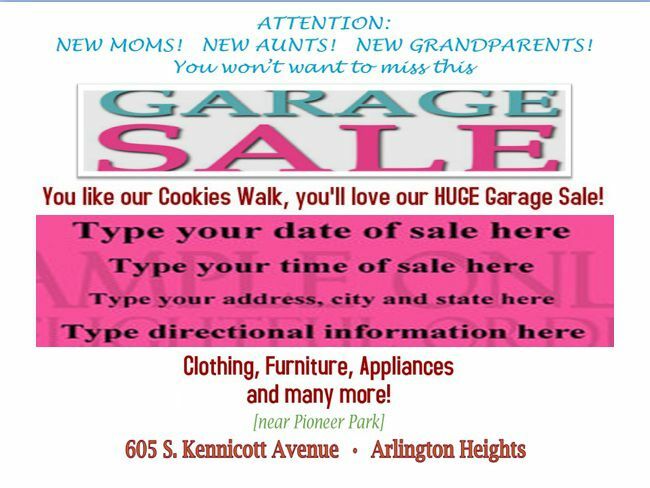 You can search for “garage sale flyer”, “yard sale flyer”, “tag sale flyer”, etc. Cancellation due to poor weather. If the sale is exposed or if there is not enough protection from rain/snow, you have to be prepared for it. In such a case if you plan on canceling the sale, include that on the flyer. Also, try to include the secondary date on which you will hold it again. If you don’t plan on accepting personal checks then include the words “CASH ONLY”. You should also try your local Goodwill or discount stores. You should also put flyers in the letter boxes of everyone within a five-minute walking distance of your house. People also put flyers on cars in supermarket parking lots, but most people find it annoying. For a sale with tools and hardware as main items, the flyers can be posted were men will notice them. Places such as near hardware stores, hotels, gas stations, etc are ideal. For a sale with baby items as main goods, the flyers should be posted near baby stores. Places like toy shops, supermarkets, kindergarten, baby change rooms, playgrounds, dance or gym classes etc are ideal. 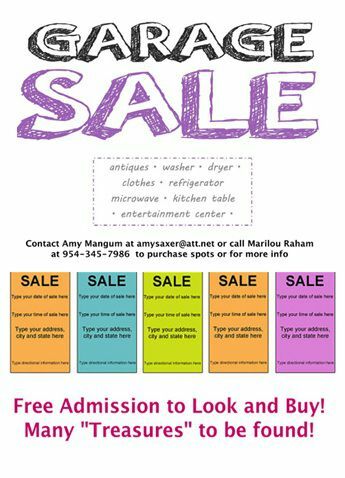 For a sale with kitchen and dinner wares as main items, the flyers should be posted near places where they will be seen by young adults. This is due to the fact that young adults who have moved out from home would need them. So consider places like colleges, universities, Laundromats, young people bars and eateries. Shoppers may notice your flyers but may not be able to make a note of the location. So to make this easier include tear-offs with the “when, where and what” details. Make small cuts in between them to make them easier to tear off. Remember to tear off one or two, so that people know that others are interested in it. “Social Validation” can be very compelling. You can have tear-offs in various position. They can be at the bottom or down the sides or you can staple a few pre-cut one to the top. 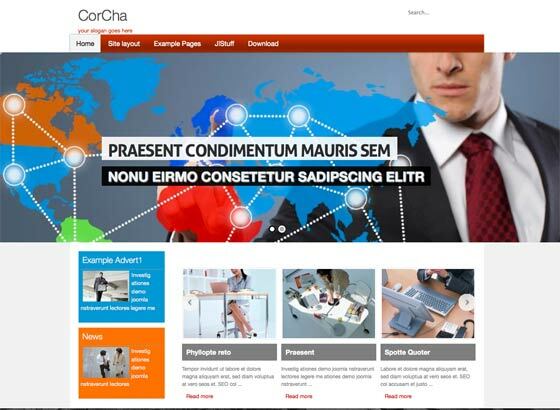 Most publishing programs will have templates for you to use. 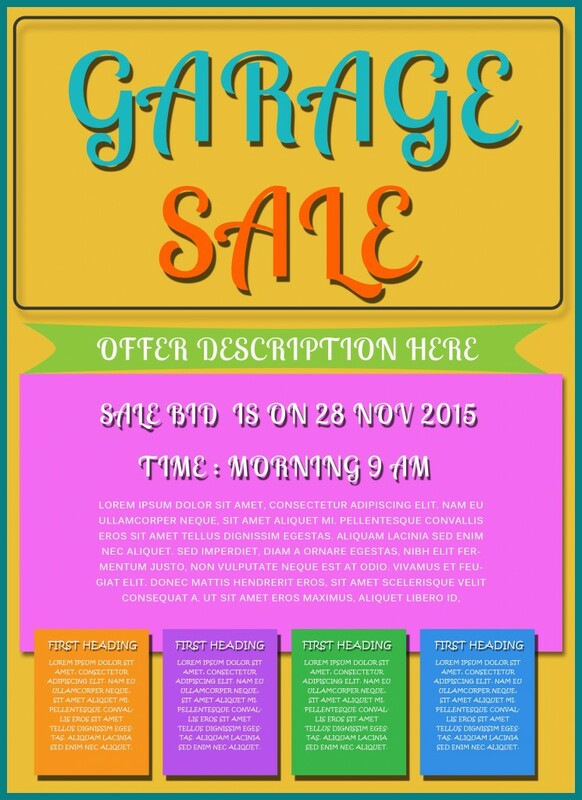 We sincerely hope that you like our efforts of presenting an awesome collection of free garage sale flyer templates. Download and modify these templates to include your own text or desired images. Please do not forget to give your comments in our comment section.